Why choose Nuffield Health Cambridge Hospital for your mastectomy? At Nuffield Health Cambridge Hospital our experienced breast surgeons specialise in mastectomy and an provide you with quick access to treatment with a treatment plan which is personalised to you. Our breast experts perform a number of different mastectomy procedures based upon how much tissue and muscle needs to be removed. During a consultation, our consultants will discuss your treatment options and recommend the most effective and less invasive procedure possible for your condition. Our brand new hospital has already built a robust reputation in Cambridgeshire for exemplary cancer care. To enhance your time spent in hospital and patient experience, all of our consultants are fully supported by our attentive, matron-led nursing team. Our nursing staff pride themselves on providing unrivalled comfort and first-class care. Booking a consultation to see one of our breast surgeons in Cambridge is easy. Simply call our dedicated hospital enquiry team on 01223 851 954 and they will book you a consultation at a time and date convenient for you. Alternatively, if you are unsure about the consultation process or mastectomy, our enquiry team will be more than happy to answer your questions. What happens during a mastectomy at Nuffield Health Cambridge Hospital? A mastectomy is performed under general anaesthetic. The length of the procedure depends on how much breast tissue and muscle must be removed to decrease the risk of further cancer. Be sure and discuss what procedure you will have and any options for breast reconstruction with your surgeon. Simple or total mastectomy - your surgeon will remove only the breast tissue. They will not remove your lymph nodes (nodes in your underarm area) or any surrounding muscles. Modified radical mastectomy - your surgeon will remove the breast tissue and some of your lymph nodes. No muscles are removed. Radical mastectomy - your surgeon removes the breast tissue, your lymph nodes and the muscles under your breast. This level of surgery is only performed if the chest wall muscles are found to be cancerous. Once you are stable you will be taken to your room. The drains placed in your wounds may be removed before you go home. Be sure and arrange for someone to drive you home from hospital the day you are discharged. Be sure and discuss any return to work issues with your surgeon. Joanne Taylor survived breast cancer, but fear and anxiety stripped away her confidence. 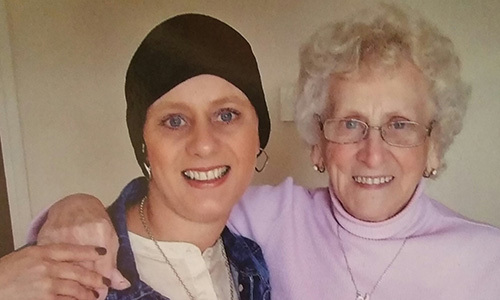 Now, after a remarkable physical and emotional recovery – she’s back in control and dedicating her life to helping women living with cancer.